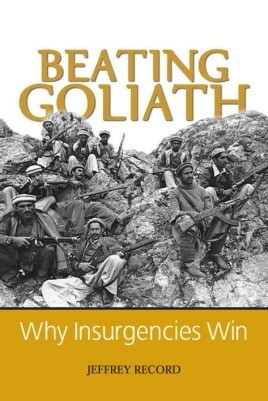 Beating Goliath examines the phenomenon of victories by the weak over the strong—more specifically, insurgencies that succeeded against great powers. Jeffrey Record reviews eleven insurgent wars from 1775 to the present and determines why the seemingly weaker side won. Unfortunately, due to sales rights restrictions, we cannot offer Beating Goliath for sale in your country. Beating Goliath examines the phenomenon of victories by the weak over the strong—more specifically, insurgencies that succeeded against great powers. Jeffrey Record reviews eleven insurgent wars from 1775 to the present and determines why the seemingly weaker side won. He concludes that external assistance correlates more consistently with insurgent success than any other explanation. He does not disparage the critical importance of will, strategy, and strong-side regime type or suggest that external assistance guarantees success. Indeed, in all cases, some combination of these factors is usually present. But Record finds few if any cases of unassisted insurgent victories except against the most decrepit regimes. Having identified the ingredients of insurgent success, Record examines the present insurgency in Iraq and whether the United States can win. In so doing, Record employs a comparative analysis of the Vietnam War and the Iraq War. He also identifies and assesses the influence of distinctive features of the American way of war on the U.S. forces'performance against the Iraqi insurgency. Make no mistake: insurgent victories are the exception, not the rule. But when David does beat Goliath, the consequences can be earth shattering and change the course of history. Jeffrey Record's persuasive logic and clear writing make this timely book a must read for scholars, policymakers, military strategists, and anyone interested in the Iraq War's outcome. © 2015 Casemate UK. All Rights Reserved.